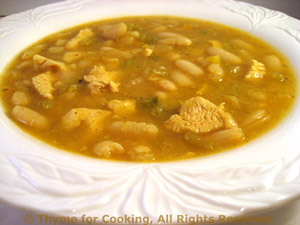 Sunday Supper: White Chili, with chicken and white beans. I used 4 cups of thawed zucchini soup that I made last summer to add body to this chili. Assuming not everyone has frozen zucchini soup on hand, I modified the recipe to use puréed beans. Note: The time assumes the beans are cooked - allow all day or do an over-night soak if using dried beans. This will be for 2 meals. Very easy, just drop and bake. The egg and 3 tsp of baking powder make these raise quickly and get quite large and light. 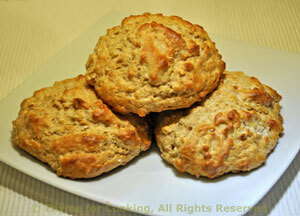 Combine flours, oatmeal, baking powder and salt in a bowl and stir well to combine. In another bowl whisk egg lightly. Add milk, honey and whisk lightly. Add wet ingredients to dry ingredients and stir gently until just combined. Bake for 10 - 12 minutes at 400F (200C) oven or until lightly browned. Take a 10 minute break - or longer, it's soup!